Today Starting Strong hosted its 2015 celebratory event, which took place in the Conrad Hotel, Dublin 2. This event recognised the significant progress made by the 21 Starting Strong participants who have completed the 2015 cycle. Starting Strong is for ambitious female entrepreneurs who are at an early stage in the development of their businesses. When the programme began in January, 16 of the 21 participants had already achieved annual sales of over €900,000 collectively. By 2020, the successful participants aspire to have a combined turnover of €250 million. The companies between them also aim to increase the number of jobs created from 70 to over 500 in the next five years. Starting Strong is designed to complement Going for Growth, which is a similar initiative but geared towards women who have been trading for at least two years. Each of the women involved in Starting Strong gain first-hand knowledge from the deep experiences of the volunteer Lead Entrepreneurs who act as mentors on the programme. The entrepreneurs involved are of an extremely high calibre and have first-hand experience of the challenges when starting and growing a business. The Leads are facilitators, providing guidance, acting as sounding boards and supporting the participants to build their own network and to learn from each other. Leads in the 2015 cycle are Nikki Evans, Founder and Managing Director of Perfect Card, Siofra Flood,COO of Drop and Susan Spence, Co-Founder and President of SoftCo. 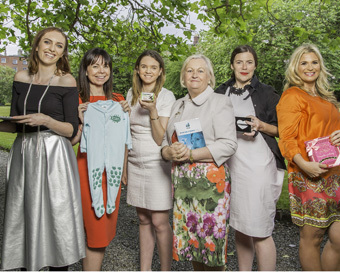 Last year, Paula Fitzsimons won the Boots WMB Empowering Women Award 2014 in recognition of her work at Going For Growth.